This book is a fast paced adventure from the opening page. But, girl, the family dramas that Erin has to go through are just insane. 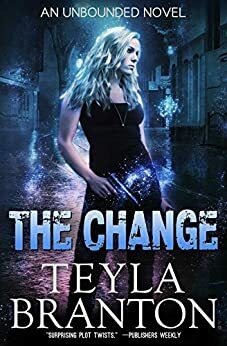 Grief, betrayal, death, revenge, action, lust - The Change has it all. I read The Change over a couple of days and found it a pretty good but really light read. It was written well and the story moved along at a good pace and has some thriller elements. I gave it 4 stars and suggest the reason it missed 5 stars was that, in spite of some original ideas, the longevity/immortality thing has been done to death in many formats before. I didn’t particularly like the way the story seemed to constantly twist about because it seems that just about everyone had a seemingly believable story that in time was proven to be a lie. And without giving too much away in the storyline I felt that there was a real question about why the conflict elements in the story were actually happening, they just seemed to lack any logical credibility. And the other thing that really annoyed me was the American style Bold and the Beautiful attraction between the principal characters. But if you want a light read that doesn’t take much brain work this one is pretty good. Trying to fit too many characters and adventure scenes seem to have diluted much needed character development, plot, emotional connections within relationships instead of these insta-love, ie kissing Keene and Ritter. In the end I can conclude that this can be read as a YA. After a graphic beginning the pace kept me reading as Erin faced one horror after another. However there is a sense that the story just finished at a random moment in order to require the reader to purchase the next book in the series. Right before undertaking a highly risky operation is not what I'd call an ending! After a satisfying ride through one volume I'll happily get the next one but I don't like feeling manipulated. I downgraded the stars as a result. Who are the good guys ? Who are the villains ? A completely different aspect of coming of age and developing powers. Who can be trusted ? 5.0 out of 5 starsA Rivetting Read ! I selected this I admit because it was free - What a surprise. An urban sci fi novel which I thoroughly enjoyed. The hip writing made me laugh and the storyline was fantastic. A great read. It was so good I bought the second on in the series !! For me this was a fresh idea for a story which I did enjoy. The writing was good just a few typos. The descriptions were good not overboard. A good read that did become difficult to put down. Will be looking at the next in the series. Always a mystery to consider& try & work out. Constantly not knowing what would be coming next. Intrigue, trust betrayed, love, passion, commitment, kept interest for every page.